Leather Carabiner Corner Keepers . This trap will install on most carabiners. 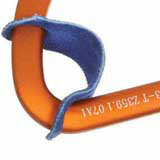 Help keep your ropes or equipment where you want them across the major axis of your carabiner.